I have said it on numerous occasions, the Epcot Flower and Garden festival has not really resonated with me in the past. Try as I might, I am just not able to raise beautiful, healthy plants. However, this year the festival is different and tastier than ever. Thanks to Garden Marketplaces throughout World Showcase, guests can taste bright, Spring-inspired flavors at 12 different booths. But, the last petal is about to fall as the festival ends on May 19, 2013. Yesterday after day 1 of orientation at my new job, I had a mild panic attack as I realized that the festival is almost over. Though I had the pleasure of trying practically all of the Garden Marketplaces, there were still a few tastes that had yet to touch my tongue. My first stop was L’Orangerie, the booth in the France pavilion, for dessert. The only item I had yet to try here was the peaches with rosemary and light vanilla cream. 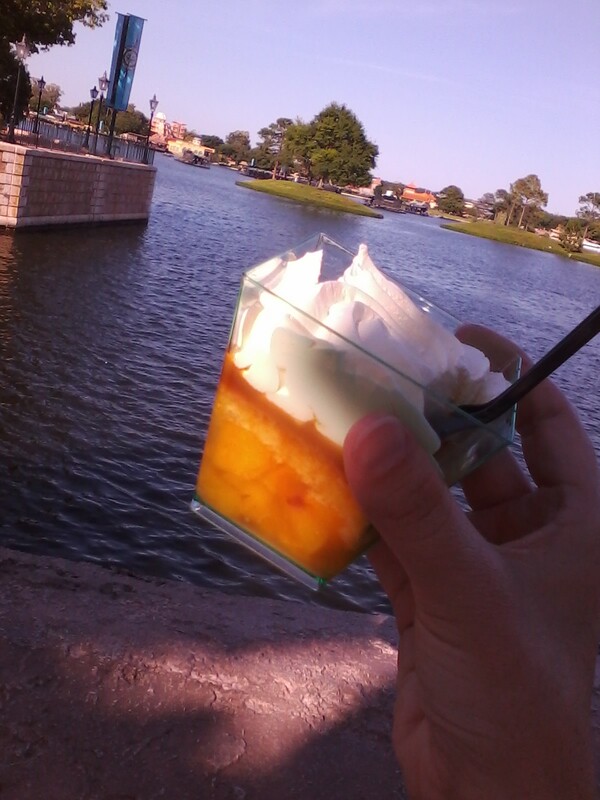 With a handful of chilled, sweet goodness I strolled over to one of my favorite spots in the France pavilion. This is one of Epcot’s most picturesque and romantic pavilions. I stood by the waterside, away from the strolling crowd. My first bite consisted mostly of the light vanilla cream which was very similar to whipped cream, but thicker and yet more delicate. Upon tasting the second bite, the distinct flavor of rosemary was both pleasurable and shocking. I had never experienced the sweet and juicy flavor of peaches with the earthy, herb of rosemary. After a few relaxed moments of admiring the beauty and romance of France, I snapped a picture of something that immediately caught my eye. 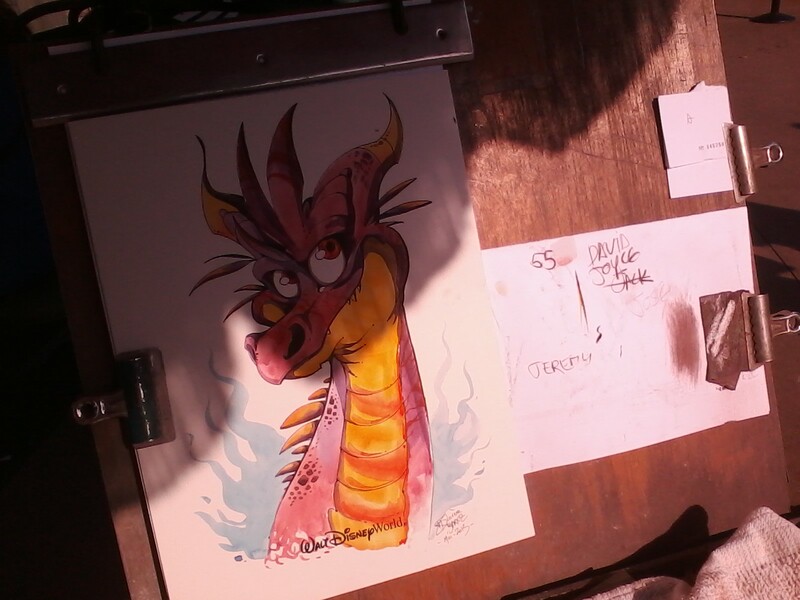 An incredible sketch of a dragon, unmistakably inspired by Figment, the lovable character who calls Epcot home. I love moments like this, a visual surprise waiting to delight the observant. I continued toward Morocco’s booth, mentally debating whether or not to stop and sample. Though I have always enjoyed the food inside this pavilion, the booths during the festivals never seem to impress me. 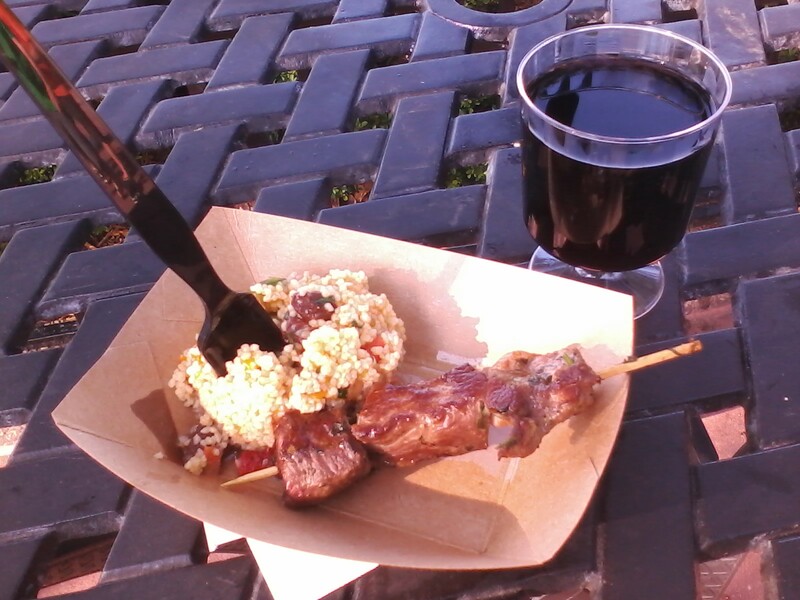 I opted for a lamb kabob and glass of red wine. 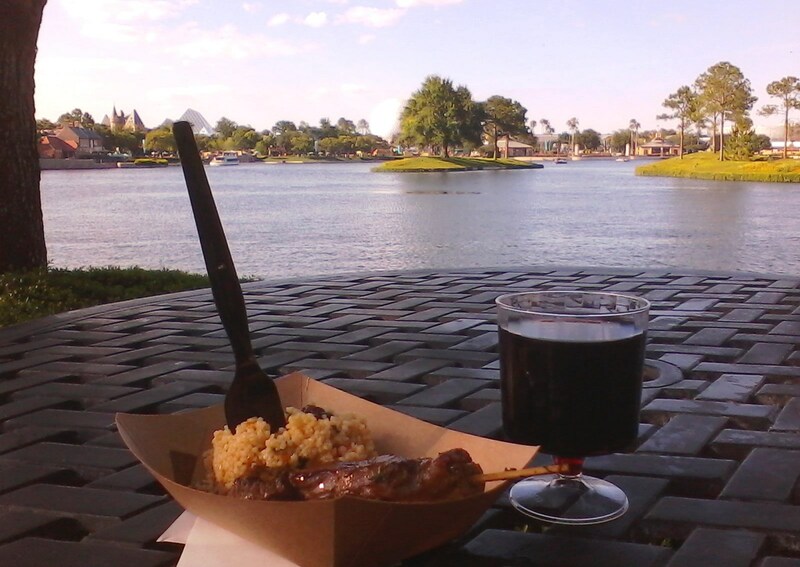 Choosing yet another spot along the water, I sipped the wine first. Heavy, pungent and spicy… it was a very powerful wine and a bit too dry for me. Unbeknownst to be, this wine would actually have me down for the count as the evening went on. The lamb was tender and flavorful, though, the last chunk was a bit fatty (however, I suppose that’s just how lamb can be). The accompanying couscous salad was nice, but would be easy for anyone to replicate. Before journeying to my next and almost final mission, I stopped at the festival merchandise tent. I soon discovered that red tags were everywhere! Practically all of the festival merchandise was 50% off! It was very tempting, but as the aforementioned red wine began to take hold, I declined to take home any of the bargains. If you have the chance get to Epcot quickly, go snag up the bargains! 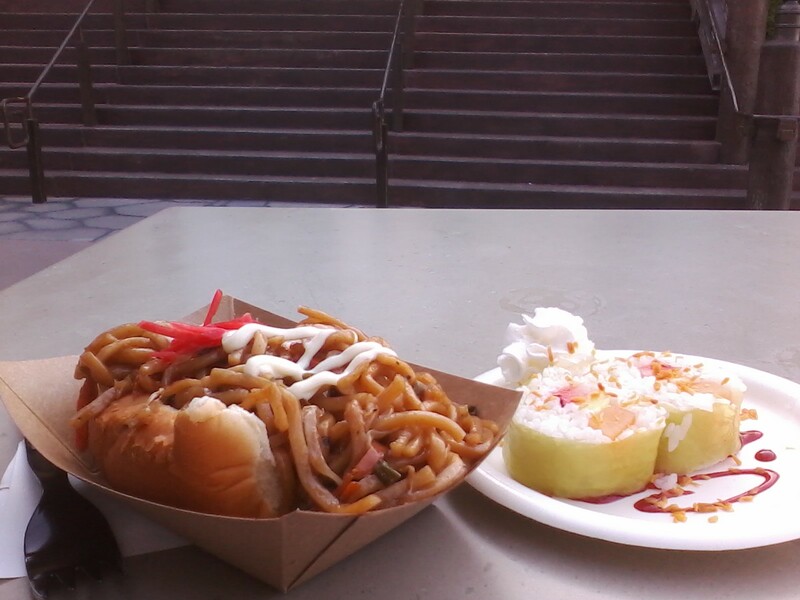 In Japan I knew I would try the frushi (fruit served in a sushi style roll), but decided to order the yakisoba pan also. I enjoyed the beauty and serenity of the Japan pavilion while sampling the sweet and fruity frushi. This could definitely be a hit for kids, but it is not a crave-worthy selection. The yakisoba pan is a noodle lover’s dream and a carb counter’s nightmare. A great choice for anyone craving thick soba noodles. At this point, the heavy Moroccan red wine had completely taken over. I am not a complete lightweight, and the serving was only 2.5 ounces at best, but something about this wine had me down for the count. I made it all the way around to China before stopping again. At the booth in the China pavilion, I had to try the Beijing style candied strawberries. I was not at all expecting what I was handed. Three large strawberries, each more mammoth than the next, were covered in a hard, light brown candy coating and then sprinkled in sesame seeds. It was unlike anything I had tasted before. The thick, crunch of the candy coating and the light bite of sesame seeds gave way to a juicy strawberry. It was messy and sticky, and I caught quite a few looks. I wrapped up my visit with a ride on the Gran Fiesta Tour. This was my undoing. The relaxing boat tour coupled with the unexpected after effects of the Moroccan red wine, zapped all of my energy. And so, I bid farewell to this year’s unforgettable Epcot Flower and Garden Festival. I hope you have a chance to go before it ends on May 19, 2013. Additionally, I hope that the Garden Marketplaces return next year with more fresh, vibrant, and fruit-veggie centric food. « Disney’s Boardwalk Bakery is Back!